Hi All on this dreary and depressing Wednesday - it's raining and its not the weekend yet and half my face book friends are either in Ibiza or were in Glastonbury teasing me with their amazing pics and cool festival style. F U you all. On a brighter note I was invited to attend the London Bloggers Party hosted by the lovely Scarlett over at Scarlett London last Saturday which was a gathering of fashion obsessed bloggers drinking cocktails and chatting about errrm guess what...blogging. 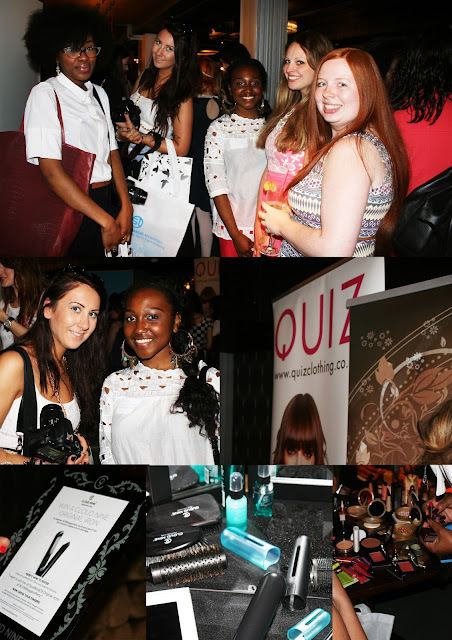 It was so lovely to have been invited along to the swanky venue just off Oxford Street, we were treated to some inside SEO information, hair care & beauty tips and a decent goodie bag when we left :-) a big thanks to Scarlett! For some unknown reason I didn't get a great deal of pics from the day but have put together a mini collage of the outfit shots my sister took and a few from inside the event. Love your outfit! Amazing colour. I would love to go to one of these, looks like fun! You always have the brightest and most gorgeous outfits! How in the world did you get your hair like that? Stunning! Wish I had a bit more volume (or hair) to create such a hairdo. The yellow is really pretty with the orange necklace. This looks like tonnes of fun, I would love to get the chance to go to something like this! I am really appreciating your yellow dress. you look amazing hunny, love the dress!